What does it indicate when your blade skips or catches on the surface of the stone? Thread: What does it indicate when your blade skips or catches on the surface of the stone? I have a question I have been wondering about a long time, and have never asked any honemeisters. I just finally got a great shaving edge on an old Wostenholm IXL quarter-hollow with original horn scales that I got as a pretty cheap buy off eBay. But it took 4 lengthy honing sessions and 3 do-overs to get there, so I earned that shave this morning. I did not use tape when honing this one, and it had a few geometry issues to overcome. 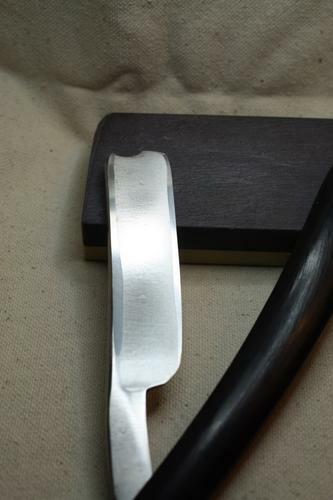 I had a hard time setting a bevel in the first place, and lost the good bevel I started with during my progression, as this has a smiling blade and my stroke consistency sometimes "wanders" when doing smiling blades. I've favored very hollow grind paper-thin razors for years, but am now really liking the thicker older Sheffield steel. There is a learning curve. 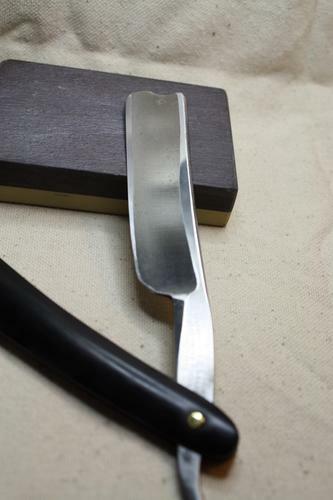 Anyhow, my question is this: each time I failed getting/keeping a good edge on this razor through the progression, the "tell" was a skipping or catching sensation of the blade on the stone during the later (finishing) stages in the progression. When I get it right, I get a nice smooth drag or draw across the stroke. What does that skipping or catching feel in the stroke indicate about the state of the edge? I get it with any natural finisher - Coticules, Thuris, JNats, or even on my Shapton 16K synthetic. It seems most pronounced on Thuris for some reason, as soon as the slurry thins out, if the edge is not right, it really starts skipping and catching. I don't see anything obvious under magnification, but I have been known to miss many things under magnification. I'm sure many other people have felt this same catching sensation when honing. I know it's a bad thing and means I have to back way down in my progression, but what is it, exactly? Curious. Was your hone lapped flat? Are you applying too much pressure to the blade and hone? These are a start for questions. I put a bevel on the edge of my hone after lapping. This prevents the edge catching on edge of hone. It sounds to me like a wire-edge. Time to do some backwards strokes and strop it on stiff linen. It is possible to wire-edge a part of the bevel and not others. Setting the bevel on heavy grinds often takes longer to get the entire edge done. If not completely set, one side or one spot will produce this sensation. gssixgun, jfk742, outback and 3 others like this. If I’m not feeling a consistent feeling all across the edge as I’m a stroke on a hone there is inevitably something not quite right with the edge. I’ve had issues with wire edges on restores, where I’m really getting after it to get e bevel set or fix something off at the edge. After having the bevel set I’d run through my progression and test shave and the edge would try and rip my face off. With a good hard look through a loop and some razor gymnastics I could see a wire edge in some spots. Now when ever I set a bevel, restore or otherwise, I set it once then run the edge on the side of my bevelsetter with only enough pressure to keep the edge in contact With the hone, maybe 2-3 swipes, then I lightly reset the bevel again. Only takes about 10-15 laps then I move on. Makes a huge difference in comfort when you come out the other side. The only other time I’ve encountered what you’re talking about is when I finish on my Arkansas but the cause on that one is too thick of a lubricant, but that sounds like a totally different situation than what you’re experiencing. sharptonn, Speedster and Dieseld like this. Your bevel is not completely set. Or you've changed how the blade is passing across the stone. For example: If I set the bevel with a particular style of stroke, ( X, Rolling X, Swoop, ect.). that's how I finish through the progression. ( same path, distance, same pressure ). Lightening up pressure towards the end. You've answered your own question, several times, in your post. "The bevel isn't right"
It skips, where it looses contact with the hone. And digs where there's a high spot. That's why I like my Washita after the big green brick, it has a very distinct grab when the bevel is completely joined. ( like throwing out an anchor ) Also sounds different, too. sharptonn, Speedster, jfk742 and 3 others like this. 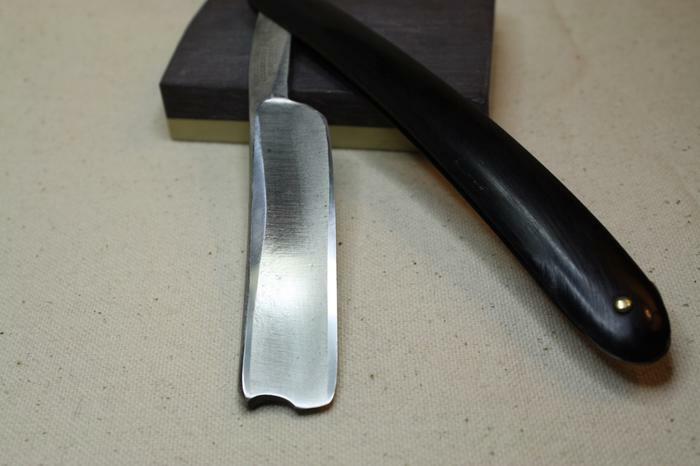 While it is possible to hone a full-hollow grind razor without the use of tape, it is difficult to hone quarter hollow and near wedge blades without using tape. Also, if the blade has some geometry issues, you need to correct them. It might even help to use a very narrow hone to make use you are honing every spot along the edge. If your hones are at least 3/4" thick, you can turn a hone on its side and hone on the side rather than the normal flat surface. However, be sure to lap the edge you plan to use. sharptonn, outback, Dieseld and 1 others like this. Thank you all for the thoughtful replies, exactly what I was hoping for. I think Mike/outback summed up several replies when he posted "You've answered your own question, several times, in your post. 'The bevel isn't right'. It skips, where it looses contact with the hone. And digs where there's a high spot." This makes a lot of sense to me. Per RayClem, I think I started out making things harder on myself than I needed to when I opted *not* to use tape on this razor. In hindsight I probably should have. 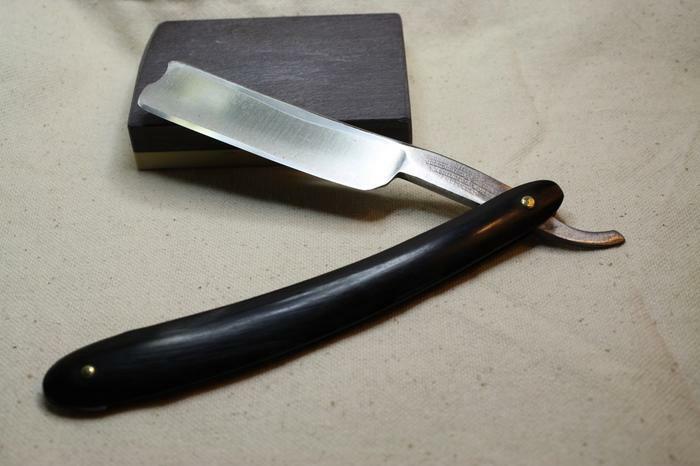 A big wide bevel on old Sheffield razors means a lot of strokes, even if everything else about the razor is great. I actually *did* use tape (two layers actually) on a near-full-wedge old W&B a few weeks earlier with good results, but I only did it to preserve the pretty "Cornucopia" etching on the blade. As a side benefit, it made the honing much easier. 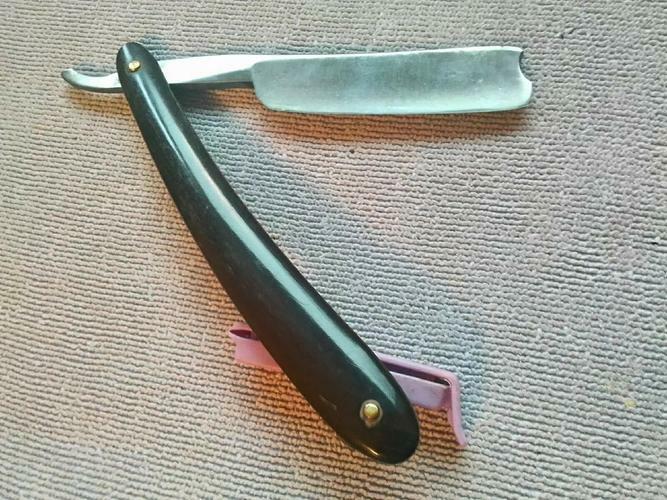 For some reason on this Wostenholm razor, because it was in much better shape to start with, I felt I could skip the tape. Since most of my experience is on more modern very hollow ground razors, I've almost never used tape, unless there is a fancy decorated spine or something. I am just learning how to hone the older thick steel smiling razors. And I do admit that I probably have more of an aversion to tape than I should have, even though I know damned well that it works. My hard-headed reasoning is "Hey, they didn't have electrical tape in Sheffield back in the 1870s, so how did they do it?" That's my traditionalist excuse, but the real reason for my aversion to tape isn't that I think it's cheating or a shortcut, but that I think it interferes with my feel of the steel on the stone - during the stroke, am I feeling draw from the tape, or the steel itself? It just messes with me, I dunno. Nobody is alive who was in Sheffield in the 1870s, but my guess is, if quality electrical tape was available for $0.99 a roll then, they absolutely would have used it. Hard to say without seeing the razor and the stone when the issue is occurring. I have noticed something similar when I get a hair under the blade. But it also sounds like other things are going on. What is the Geometry Issue you were trying to correct? Start with the razor, post a photo of the razor in question. To take a page out of Euclid’s book, ink the bevel. A lap or two will show where you’re missing, especially easy to see on those wide beveled Sheffield’s. Thanks Euclid, here are a series of pictures. The first picture is from the original eBay listing, before I honed it. The rest of the pictures are after I fully completed honing, and shaved with the razor. It has a good edge now, and shaves well. But I think it took more way more effort and steel removal to get there than it should have, so I'm always trying to learn. Looking at the razor now in the pictures, it's maybe closer to a wedge than quarter hollow. I honed without tape. My progression was to start with bevel setting on a 1K Chosera, followed by a Nagura progression of Botan - Tenjyou - Mejiro - Koma on a hard bench stone, then Tomo Nagura, then finally just water on a different stone, a soft and fine Asagi. I has to start over three times, because I didn't get a good bevel the first time, and two more times I lost the good starting bevel somewhere during the progression. The "geometry issue" I was referring to is that the heel of the razor had a very difficult time getting good contact on the stone, even with a rolling X, because of an extra thickness of spine near the shoulder of the razor. The shoulder thickness extended further on the right face than the left (stamped) face, if that makes sense. It is visible in the 3rd and 4th pictures. 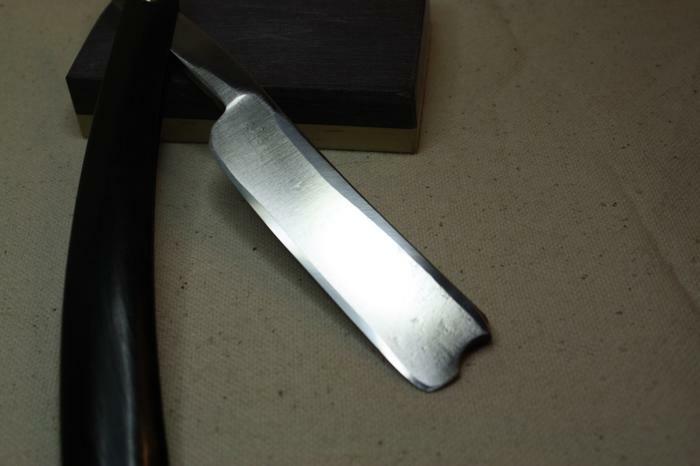 But overall there was a thickening in the spine in the rear half of the razor which made it difficult to set the bevel on the heel. It was worse on the right side than the left. Right face of razor after honing. This shoulder and heel gave me a lot of trouble. Another view of the right face. If you look toward the top of the spine, you can see that the honed portion of the spine stops short of being lined up with the honed heel, even after a lot of honing and steel removal. But it was enough to get the bevel to take with a rolling X stroke. The left face didn't have as bad an issue at the heel with the spine. But the spine still had a lot of thickness towards the shoulder end of the razor compared to the tip end. I had to remove a lot of steel to even it out across the length. Tape might have helped a lot with this.